I had a phase where I did a ton of testing, anything that came up, I threw my hat in the ring. I've been doing it a bit less for two reasons: one, as a form of self care I have been on facebook less (I deleted the app from my photo so if I want to look there I have to use the intentionally crappy mobile webpage) and two, I thought about how many hours I spent doing a test, plus the cost of muslining, sometimes more than once, and I had "spent" so much more "paying" for my own time than if I just bought the pattern. That was until I saw the call for the new Itch to Stitch pattern, the Dana Point Top. It was just what I wanted (and I wanted it NOW). Kennis is a fantastic drafter and her patterns have clear instructions and diagrams and best of all, layers! I think this is my all time PDF pattern feature. Anyhow, I've tested for her before, the Lisbon Cardigan which I actually managed to blog about and the Belize Shorts and the Vienna Tank which I didn't. The Idyllwild Tee is my TNT knit top and I love my Lindy Petal Skirt (free!). I'll get back to that later. All of this amounted to me eagerly applying and joining the test team for the Dana Point Top. The fabric is buttery soft, breathable, with a lovely drape. Only problem is it's black, and the back is dark grey, and none of my damn chalk markers or transfer paper and wheel would work to show the markings I had to transfer. It was so lightweight that even when I used pins or thread to mark points they would fall out. Amazingly, for all it's shaping, only has two pattern pieces, the front and back. This is one of the blessing/curse things with this pattern. Unfortunately that means each piece has six pleats, multiplied by two because you have to do the same again for the linings. If you cut a C cup or larger, there's also bust darts. My fabric also had the bonus of being slippery. 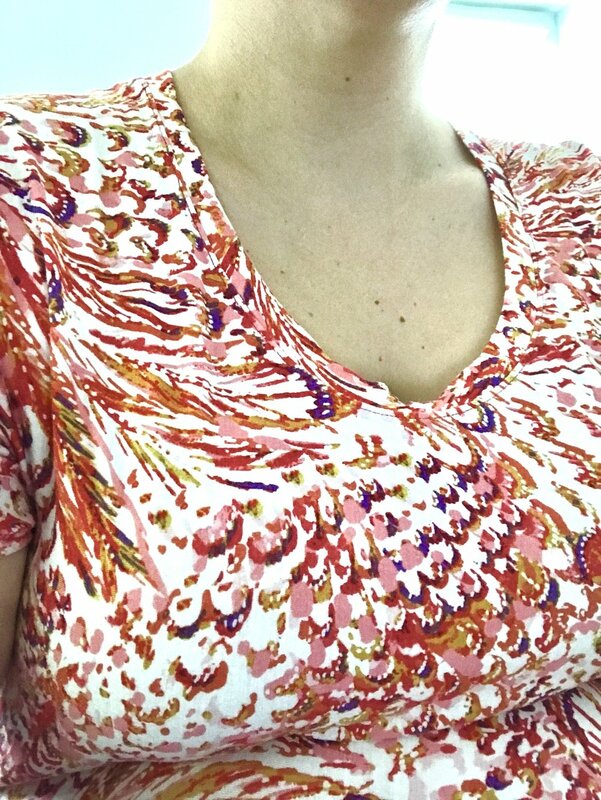 Next time I make this top (not this year, I'm all pleated out, sheesh!) I will use a lighter fabric that will take my frixion pens and maybe try doing the gelatin method to stiffen the fabric as I trace and sew. So with all that, I finished my final version a week later. But damn, am I pleased with the final result! Seriously, I love this shirt. In the end I didn't have enough buttons so I invisibly hand stitched the button "bands" to overlap as they would when buttoned. I had planned to sew dummy buttons on top to be decorative but I'm really liking it as is. I like this thing so much I've already begun scheming the hacks I want to try in the future. Extended to knee length to be a dress, for sure. And can I hack the front so that it's a single cut on the fold piece now that I know I can fit it over my head without unbuttoning it? I think I'm going to have to hit up Gaffney and see if I can get any summer weight fabrics on clearance to stash away for next year. While I'm at it I'm going to grab some ponte or scuba to make a black Lindy skirt to go with it. I tried Dana Point on with my cream, black and plum leopard print Lindy and the silhouette was perfect (despite the intense pattern clash). In the end, I think my problems were mostly down to fabric choice and going forward I shouldn't have problems with it in the future. Even if it weren't I think the fit and style would be worth it. I wholeheartedly recommend this pattern. This post contains affiliate links. If you purchase through one of these links I earn a small commission but the price remains the same for you. I only recommend things I can truly endorse and all opinions are my own. So, I did a thing. I couldn't resist. In my defense, she loves to wear matching stuff. I do too. I love the compliments and feeling cutesy with my girl. Confession: I'm not going to stop until she makes me and I hope that day is far, far away. Pattern is the free Popover Dress from Oliver and S. It took about 90 minutes from idea to finished product and that was mostly due to the fact that I did a bias tape hem instead of a double fold and that I tried it on her to double check the length of the shoulder straps (I didn't bother measuring against the cut pattern piece). I used leftover fabric from my Jessica Dress. You can check out the details in my last post here. She loves it, it's super comfy. I recommend it if you need a quick palate cleanser project. I can easily get a size 3 (that's what I used, same as last year. She's gotten taller but not broader.) on less than half a yard of fabric. And in case you need further proof that we are related, here you have it. I know, I know. Two posts in a week. Wild. But here's the thing: I made a dress and I'm obsessed. See? It's fantastic. It's awesome and I feel awesome in it. I visited my parents in the spring and came across an old shirt of my dad's that I wore through high school. It was a white and blue striped loose weave cotton shirt he go from Greece in the early years of my parents marriage. I became fixated on finding a similar fabric to make myself a breezy summer dress. I was prepared to drop a bunch of money on yardage to make my vision reality. (I never do this. I am a fabric bargain hunter to the core.) And as if I had forgotten the wonder of a true find, the perfect fabric showed up at my usual place, Gaffney Fabrics. It was exactly what I wanted, white with an uneven blue stripe on a loose weave cotton. Oh, and did I mention it was $3/yard? Knowing how in love with the fabric I was I searched around for a pattern suitable for my summer uniform dreams. I was wavering on the Chalk and Notch Fringe Dress, a pattern I've been keen on but not entirely won over by since it debuted. In the end though, I worried that it was a style that had just as much potential to look like a sack as it would to look amazing when cutting the biggest size and I wouldn't know until the whole thing was finished. 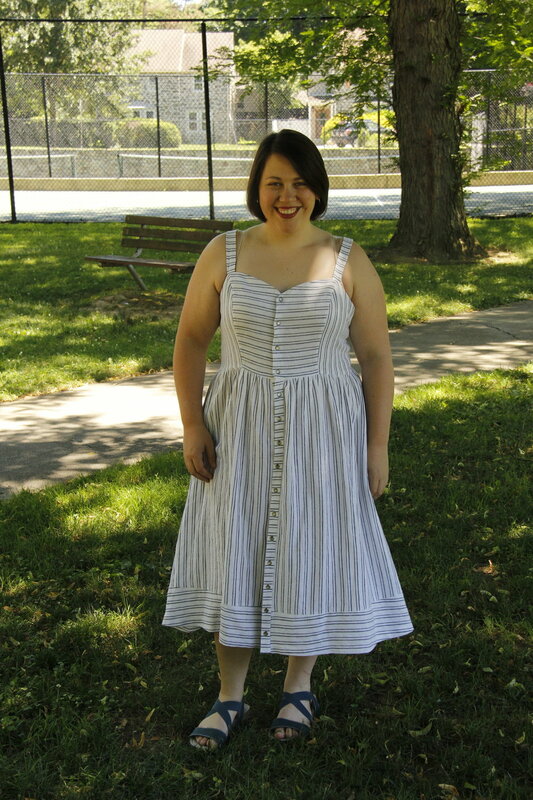 Then my online sewing friend/muse Bianca posted this dress. It just screamed summer. Plus, it was a free pattern! (I am not opposed to paying for a pattern, not in the slightest, I just know how much information I can get from looking at the actual pattern rather than the pattern description. You can see the quality of the drafting and instructions, the style lines, how everything is organized, whether it's the type of pattern that just comes together beautifully or is a headache every second you touch it.) The pattern is the Jessica Dress by Mimi G. and it's a free pattern download when you subscribe to her newsletter. I highly recommend it. It's a well drafted pattern with a good size range and clear instructions. I "color blocked" my version by playing with the directionality of the stripes. This meant that the only stripe matching I had to do was across the center bodice pieces whose stripes I wanted to line up. Everything else was perpendicular to its neighbor. The bodice button band is grown on so that made things even easier. I had originally planned to make the bottom hem a big ruffle (that huge 70's ruffle is so in right now) but I only had 3 yards and that just wasn't going to cut it. In the end I cut one strip as wide as the hem of the skirt and as deep as 2(band length + seam allowance) and folded it in half wrong sides facing. This makes a lovely visual addition and also mean my very favorite thing in sewing: NO HEMMING! I widened the straps a touch so that they are the same width as the button band and can cover a bra strap. I interfaced them so they wouldn't stretch out on me (they still do a bit. Best laid plans and all that). I used my new snap setter and some pretty grey pearl snaps from an etsy shop called Bags, Beads and More. I ended up with 15 sets of snaps down the front so the setting took forever but I think it was worth it! Plus, no buttonholes to sew or buttons to sew on so there's that. I also got a set in black and a set in peacock teal that I'm sure will make an appearance at some point. As for sizing I graded the bodice between the top two sizes and I believe I used the largest size for the skirt (extra fullness on a gathered skirt can only be a good thing) and shortened the length a touch to hit me at a better length. It fits beautifully but I have a bit of extra room in the underarm so I'm debating sizing down in the bodice for the next time, but I'm having to weigh that against the loose weave of the fabric and the likelihood that it stretched beyond the original size as cut. That said, there will totally be a next time. I think I need this as a top with a peplum, a dress with a skirt hitting just above the knee and a full on maxi. I'm planning a version with a lined bodice and one that has topstitching everywhere. Basically, I freaking love it and you should make one. My husband and I met in October of my freshman year of college. We've been married since 2010. In the almost fourteen years I've known him I've frequently offered to make him things. In all that time I can detail exactly what I made, with and without permission. Before I thought to ask him if he'd even like such things I knit him a scarf and crocheted him a throw blanket. The scarf was a green and brown Homespun, likely in garter stitch that has since been lost to the ether. The blanket lives in the closet. I think he likes it fine but it doesn't get a ton of use. Since my skills started to broaden, I began to ask him what he'd like (I realized that if I was going through the expense and trouble to make him something I wanted him to both like and wear/use it). This, friends, may have been a mistake. In the last ten years or so, all I was permitted to make for him was a single watch cap. It is brown and simple but it does look quite nice on him. I used vintage Australian wool I got from an op shop while I was living there in 2007. I grew tired of being able to make these wonderful things and not share a bit of shine with my honey. (It's how I show love. I get it.) I offered to knit him a sweater which he repeatedly declined since he doesn't much like wearing sweaters. (In hindsight I'm glad he didn't let me knit some fine sweater for a six foot tall person that would never get worn.) So I decided to really look at what he did wear. Enter the Fairfield Button Up from Thread Theory Designs. His wardrobe of tops consist in large part of polos, graphic tees, and button ups (largely in a plaid cotton). I showed him the pattern and asked his thoughts. He gave the go ahead and I got to work. I hit my favorite fabric store (Gaffney Fabrics in Germantown, if you're in the Philadelphia area) and found a cute print (Dear Stella Fabrics Jetsetter print in Sky, unfortunately discontinued) on sale so it wouldn't be so precious if I needed to make some fit changes in the next iteration. I took measurements and double checked with the helpful Morgan at Thread Theory to make sure I was choosing the right size based on those measurements and then I got to work. I made used the Average Figures block, the darted back which I think looks lovely and slimming, the standard pocket (the pattern comes with one pocket style but there is a free download of three additional pocket shapes available) and the short sleeve from the free sleeve download. If you read the sew along, I used the less stiff interfacing scheme and just did one button band (the one with the buttonholes), one collar piece and one collar stand. Instead of topstitching the inside collar stand I hand stitched it for a clean finish. I used a double border of topstitching to attach the pocket. I found the instructions quite clear and very rarely had problems. The drafting is really spot on. I used my blue frixion pen for markings and they came out completely with the iron. I highly recommend trying these if you haven't. The marks will reappear below 30 degrees F but I'm not worried as this is a summer shirt. My only problem was when I accidentally cut the directional print of my upper collar upside down and only realized after I'd sewn the whole thing, trimmed the seam allowance and turned and pressed it. Luckily I had a good amount of extra yardage to redo it. Most of the garment is constructed with flat fell seams so it has a beautiful, professional finish inside and out. To facilitate this, some of the seams that match up have different seam allowances (for instance a seam where one piece has a 5/8" SA and the other a 1/4"). You line up notches at the edge but I did not like having to justify the piece with the smaller seam allowance along that long seam. Yes, it meant no trimming at the end, but I didn't want to just eyeball things so I measured out the difference and marked it all the way down. My preference would have been to trim later but I could see where the designer was coming from with this approach. My only other qualms were in the absence of two things I really like to see in PDF patterns: layers and a map of the full document so you know which pages to print for the style you're making. Layers let you print only the size you need and avoid the guesstimation at the points where several close lines blur together in a blob. A map lets you save on printing. As it was I ended up having to print both back pieces (this pattern has the option of a pleated back or a darted one) even though I only needed the darted one. All in all I'm thrilled with how this came out. He liked it so much that he not only put it on to wear to work but agreed to quickly pose for photos before he left! Once he's back I may pop with a shot of the contrasting inner collar stand and my label on the inside yoke. I will certainly be making this again and am just over the moon to have found something I want to make and he wants to have. I'll add a touch of ease in the midsection per request and try to troubleshoot the draglines at a front and back armholes. Might a rounded/forward shoulder adjustment help with that? I may try a small one next time using the fitting instructions from the sewalong in this post. Oh, and I'll ignore the button markings and make my own since the top button is a little low for his liking. Tiny tweaks. This really is a great pattern with serious TNT (tried and true) potential. I recommend checking out Thread Theory if you're looking to sew menswear. They have a free undershirt pattern you can try out to get a feel for their stuff. They also have two womens' patterns, one of which, the Camas blouse, I've had finished but for some fiddly topstitching (a breeze on wovens, an epic headache on knits) and some hems. Hopefully I'll have an update with that one soon. This is my dear friend Stefie. We met in college, were in the same fraternity. She is just a wonderful human being. We have all sorts of things in common, but one of them is a love of this stationery brand Rifle Paper Co. I was beside myself last year when they put out their first fabric collection with my favorite quilting design house, Cotton + Steel. Completely unprompted, Stefie messaged me about it. We both loved it. Stefie had just gotten engaged to the kind of person you always hope your best friends will marry: smart, funny, kind, and loves the hell out of your friend. Pair that with the knowledge that Stefie is worthy of handcraft and it was obvious: Stefie and Marcus were getting a wedding quilt. I thought a lot about exactly which fabrics to use, what pattern to make. I settled on my own spin on the Wanta Fanta block from Blossom Heart Quilts (it's free if you want to try it too). I am many things, but crazy enough to attempt a traditional Double Wedding Ring Quilt I am not. I just loved how the combination of snowball blocks and a paper pieced cross could make a block that looked so similar to the DWR. I did a lot of sketching and math (I rearranged the blocks so that the edges would be complete circles floating on a background rather than being bisected by the binding of the quilt), followed by a lot of shopping (my background fabric was a variety of white and off-white low volume fabrics), followed by A LOT of cutting followed by A LOT of sewing. I stood on balconies to assess my layout, arranging and rearranging. I used SuzyQuilts' tutorial for chain piecing blocks. I did a lot of ripping and resewing so that points matched perfectly. Eventually my top was finished. I sourced and pieced my backing fabric (Cloud9 organic cotton from my ever favorite Gaffney Fabrics) basted and got to quilting. Friends, when I tell you that this nearly killed me I only exaggerate slightly. For love or money I could not get my machine to keep good tension. I quilted, ripped and restitched the same sections. I gave up to preserve my sanity (and my neck and back!) many nights but I kept at it. I had the wedding date as my target but I had a countdown clock of another sort limiting my craft time and my baby made his presence known (oh yeah, surprise! I had a baby!). I missed my deadline. But I managed to pull it out and finish it up and bang on a label (my first appliqué!) this week in time for a trip to NYC this weekend. I handed over that amalgam of cloth and thread and love that I'd had my hands and heart on for over a year. I'll admit I was a little sad to give it up but I know it will be well loved with them. Congrats you crazy kids. Use it in good health. Everything here is blooming. Spring is in total swing here in Philly. Unfortunately, the temperatures haven't gotten the hint. It's a high of 60 today. At least I have pretty stuff to look at while I'm back in boots and jeans. It's raining buckets here. I feel like Nina and I are Sally and Nick at the beginning of the Cat in the Hat. At least the snails are happy. I'll document my progress as best as I can manage on my instagram account: @KnitsMcGee. Today I'm wearing an Itch to Stitch Idyllwild Tee (my TNT t-shirt pattern) that I lengthened to tunic length and made into a swing top using this tutorial from Hey June Handmade. It's just a selfie shot since I slept in wet hair last night so my hairdo looks like I woke up at 7:56 for an 8am class. At least you get to see the pretty neckline which I totally nailed. If you want to follow along with the Me Made May fun, hit up the Instagram hashtag #mmm17. I am a magpie when it comes to patterns. Always into the new and shiny. I love the Jo-Ann pattern sales and just grab up tons of $1 Simplicity and $2 McCall's. But as I get more experienced at sewing garments for myself and my kid (all of my early, formal sewing education was costuming, so I never got much guidance in how to select and tweak patterns for my own body), I'm learning the value of TNT (tried and true) patterns and designers. For me, I love Itch to Stitch. Kennis' block is just spot on for my body and her designs have a really classic, wearable aesthetic. The only changes I have to make are usually to add length (I like tops longer than most designers or RTW manufacturers for that matter, design them) and sometimes grade between sizes, depending on my body measurements. 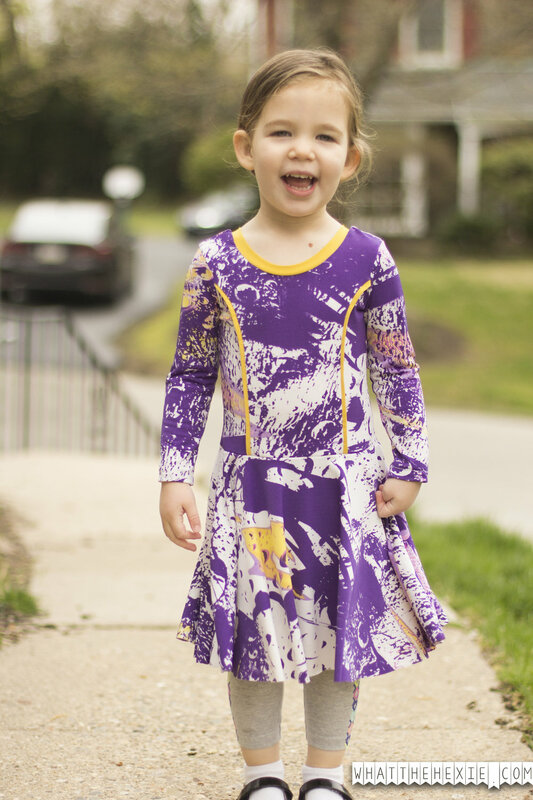 Likewise, I've found the perfect designer for kid dresses: Bubby and Me Creations (the designer of my all time favorite kid sew, the Ava Dress). Both designers have really clear instructions, with professional finishes and layered pdfs (this is HUGE. 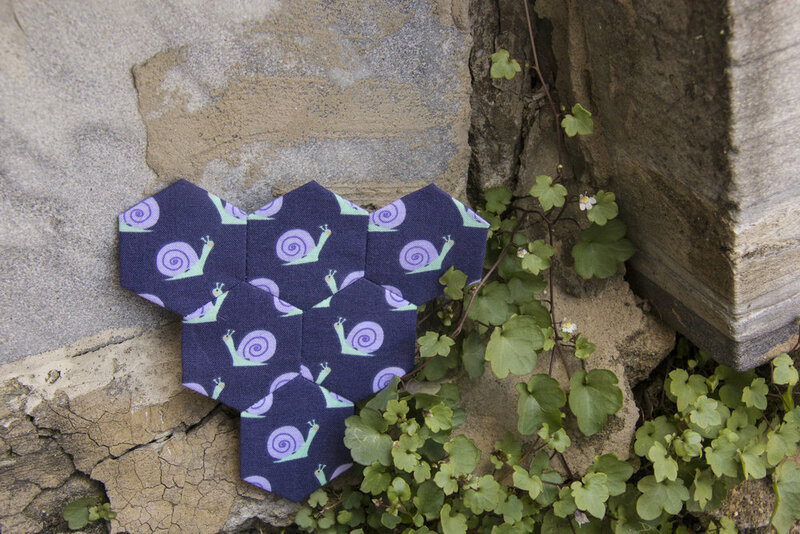 It means that you can print the pattern in only the size(s) you need. No more going blind trying to find your line where ten sizes converge!). I've been lucky enough to test upcoming patterns for both of them as well. In fact, I've got some tester photos and a review of the newest Bubby and Me pattern for you now. Poppy is a knit, princess seamed dress in toddler to big girl sizes. It has options for long or puffed sleeves, or sleeveless with armbands. It has circle and gathered skirt options (I went circle for both of mine for two reasons. Number one is obvious: maximum twirl factor. Photo evidence to come. Number two is my own oddity, but I feel like I have a problem with my serger making gathered seams in knit waistbands appear in big bumps rather than nice gathers when I finish the waistband seam allowance so I just try and avoid them.). There's optional faux piping (which looks so slick and was super easy) and a ton of color blocking opportunities. I made the first version with long sleeves per her request but now that the temps are warming up around here (HELLLOOOOO SPRING!) I'm planning to shorten the sleeves this week. There was no unpuffed short sleeve cut line in the tester version so for the flower dress I sewed up the long sleeve version, tried it on her, had her point to where she wanted the sleeve to end, cut it an inch longer than that and hemmed. I didn't bother to hem the purple skirt because my fabric didn't even curl. It looks even better than the rolled hem I attempted on the subsequent version. Here's a shot of the faux piping because I love it so hard. I'm totally using this trick in garments for myself in the future. If you couldn't tell already, I highly recommend this pattern. I've gotten tons of compliments on it and I have to explain to Nina that she can't wear the same two dresses to school every day. Once I have a bit of time to sew for myself I'm going to make up a few sleeveless versions for this summer. With pockets this time (once I find a pocket pattern to steal from elsewhere) because the circle skirt has side seams. This has the added bonus of taking less fabric because you can stagger the pattern piece instead of needing the full width to cut a traditional full circle skirt. You can get Poppy for yourself (well, your kid. I keep nagging on Nikki to make her designs in mom size too. I'm milking the age where twinning with mom is cool for all its worth!) right here. And send me your photos when you're done, I want to see! Best of all, Poppy is on sale right now for $9! It will go back up to the regular $11 price in the next few hours so go ahead and snap it up now! This post contains affiliate links. You pay the same price if you buy something but I earn a small commission if you purchase after following my link. She's a lot bigger now than when this photo was taken but she still loves that phone (9 times out of 10 she pretends to call my father-in-law and all she'll say is "Hello? Papa Alan?") and Legos. I'm still pretty proud of my fussy cutting on this one, I think it came out really well. Part of why I disappear for a while is always that I'm bad about blogging. Well, probably more truthfully I'm bad about remembering I like to blog. When I'm not doing it it feels like a chore so I avoid it. When I finally sit down and start writing I tend to write a bunch at once. keep offing making more of these blocks. I won't lie, I'm enjoying having other projects to work on. I'm making tops and dresses like mad (especially for the kid). It wouldn't be the worst thing to have a handwork project on the go again, but I've been dragging my feet on it, especially since I'll have to get back to the hand sewing anyway to piece the whole top together. Oh, also, by laying out my rows, I totally spaced on marking the blocks I've already photographed for the blog (I had stored them separately to prevent duplication) which just adds a layer of complication. 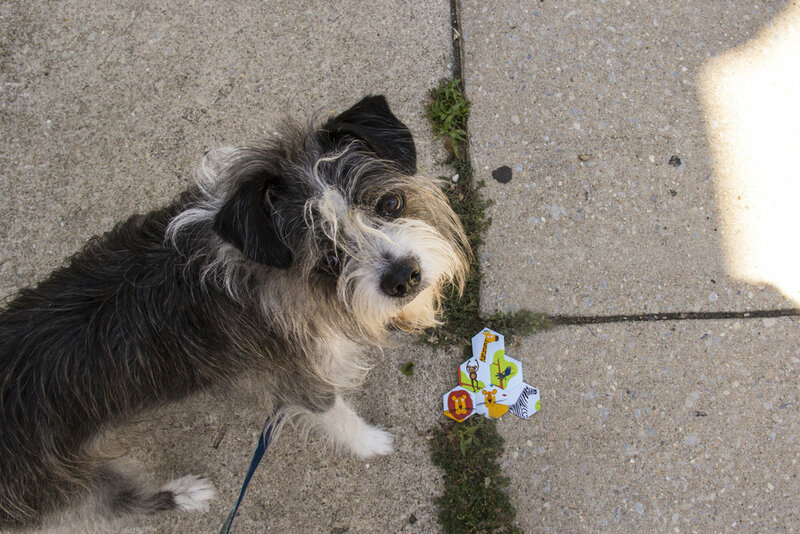 I'll stop whining now and give you what you came for, hexie of the day. that will subject everyone to pictures of their dog. This is Cappie. He's snoring next to me right now. I love the stuffing out of him. Poor guy, he was so freaked out by the thunderstorm this morning. Extra snuggles for me and the kiddo before preschool. And I guess I can throw in a close up of the actual block, if you want. I've decided to stop fretting about how long it's been since I blogged last and just get back into it. This morning I let the dog out and it was so much warmer than it has been. In the few minutes I stood outside I counted six different bird calls. I couldn't believe it. Spring is finally here! (Despite my crazy allergies, spring is my absolute favorite season.) 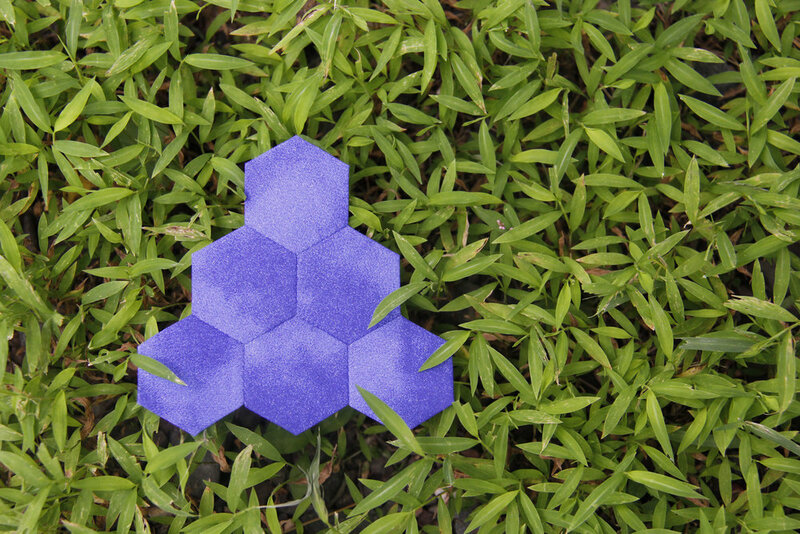 So here's a springy hexie I photographed last year. This kid, she slays me. Sometimes a block will just scream out where it should be photographed, bugs in the grass, matches on the grill. Sometimes I want to shoot 20 blocks but my kid refuses to leave the house so I have 5 feet in either direction from my front door so I can still see her through the window. There are only so many times you want a concrete backdrop. It's these moments, friends. Necessity really is the mother of invention. My background is a workout dress I'm wearing today. Hey, it works. I've done a lot of these (close to 500 at this point) so naturally there are some I like better than others. My friend Meghann sent me scraps of this Lizzy House constellation fabric. It's my current fave. It just makes me happy. The fabric has a lovely hand, cushy and soft and plush enough to hide all the stitching. This one will get a prominent feature in the final quilt (whenever that actually happens! ).